Gardner Dozois is downsizing and selling his book collection on Craigslist. Science Fiction & Fantasy books for sale. Personal Science Fiction & Fantasy collection of Philadelphia’s own 15 time Hugo award winner, Editor, and Science Fiction Writer Gardner Dozois. This collection was compiled over 40 years and contains more than 200 titles. Ack! Gargle-blargle, flail, tantrum, WAAAAH! If only I were rich. WANT. I weep bitter, bitter tears. I am with you mintwitch. I am desperately fighting the urge to click on the link and browse, browse, browse the day away. As far as I can tell, there’s nothing in the link that isn’t in this description. Maybe I missed it, but I can’t see any description of what is actually in the lot to be sold other than “200 titles”. There is a bit more detail at Gardner’s Facebook page. I am saddened by the necessity, but it would be great if these books found a good home. Remember not to drool on your keyboard. Hmmm. My quest to review a sampling of all the Best of anthologies is still stumbling over the early examples but he doesn’t seem to have them. 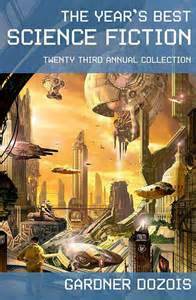 Plus short-story collections by James Tiptree, Jr., Cordwainer Smith, Damon Knight, Robert Silverberg, Joanna Russ, Poul Anderson, Howard Waldrop, Ursula K. Le Guin, Greg Egan, Arthur C. Clarke, and many others. Plus novels by Kage Baker, Poul Anderson, Robert A. Heinlein, Ursula Le Guin, and many others. would still be very very nice. I have more than 300 SFF books; I believe my brother has even more. I am not impressed by the Dozois collection. My thought: only 200? Maybe that’s what he is getting rid of. Keeping is another matter. I bought only one title at the recent Balticon. I realized I had more books in my house than were being offered for sale in the dealer’s room.. I have been downsizing for a while. I assume that many of the books are rarities now, especially the single-run collections. Part of my interest is in what books someone like Mr Dozois would have kept for 40 years. I mean, my basement/library is frankly ridiculous (I could open a fair sized bookstore), but that is because I find it nearly impossible to part with a book once acquired. I don’t even sell my ARCs-I’m just that OCD. I’m sure Mr Dozois has sold, traded, or given away more books than I will ever own. Nah, that last comment should be directed towards Darrell Schweitzer who has said that parts of the stairs in his house are bookshelves. I’ll add here that I started to Goodwill many titles because I was given many by my parents (100 Star Trek novels, many best sellers and a lot of other material, including two sets of Encyclopedia Britanica) and duplicates and very rare books. I also wanted better access. And I don’t want the look of a hoarder. I guess Gardner doesn’t want to fall over a pile or have one fall on him.